The Everest S9000 is designed for customers who require a stainless steel, IP65/NEMA 4 sealed unit to meet the hygienic standards in food processing, healthcare, chemical and pharmaceutical industries. The S9000 is also suitable for conditions that require a water resistant terminal such as outdoor kiosks, clean rooms and some marine applications. "We designed the Everest S9000 for a valued customer in food processing who needed a rugged computer terminal that could withstand caustic daily wash-downs and consistently perform to the same standard as the Everest series models they were currently using," states Dan Poisson, Director of Engineering for Glacier. "The S9000 stainless steel terminal provides a smooth casing with a flush-mount resistive touch panel and sealed IO connectors making it virtually waterproof." says Poisson. The Everest S9000 utilizes the INTEL Atom N270 1.6 GHz processor with a 2.5" SATA HDD, Internal 802.11 a/b/g/n, dual internal antennas, 12" and 15" displays and will offer optional mounting systems, external power supply and power adaptor. 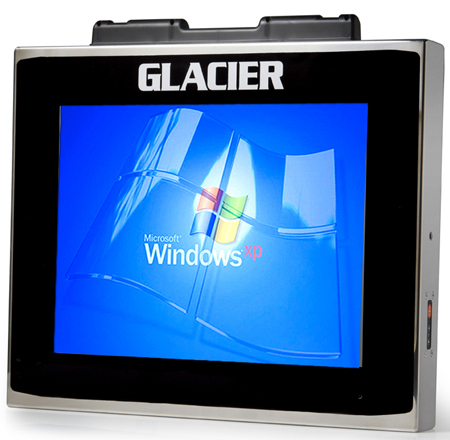 Glacier is excited to expand the current Everest Series models E5000, E4000 and E2000. The S9000 will run Windows® XP and Windows® 7 operating systems.